For Spring/Summer 2015 we are proud to present our new value range of flip flops. 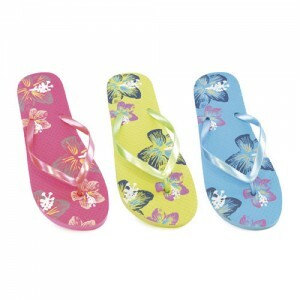 With prices starting at a fantastic 59p for our children’s flip flops. Modern styles available for men and women. With a fantastic variety of colours; whether your customers are looking for a cool flowery look or a more contempary style then there is sure to be something to suit your customers taste. A super addition to our wholesale footwear range. All are manufactured from a soft feel with hard wearing rubber. We feel they will be a great addition to your shop, Amazon or eBay store. Click on the image below to see the range of wholesale flip flops we carry. This entry was posted on Thursday, March 19th, 2015 at 5:19 pm	and is filed under New Products & Specials, Wholesale Footwear. You can follow any responses to this entry through the RSS 2.0 feed. You can leave a response, or trackback from your own site.